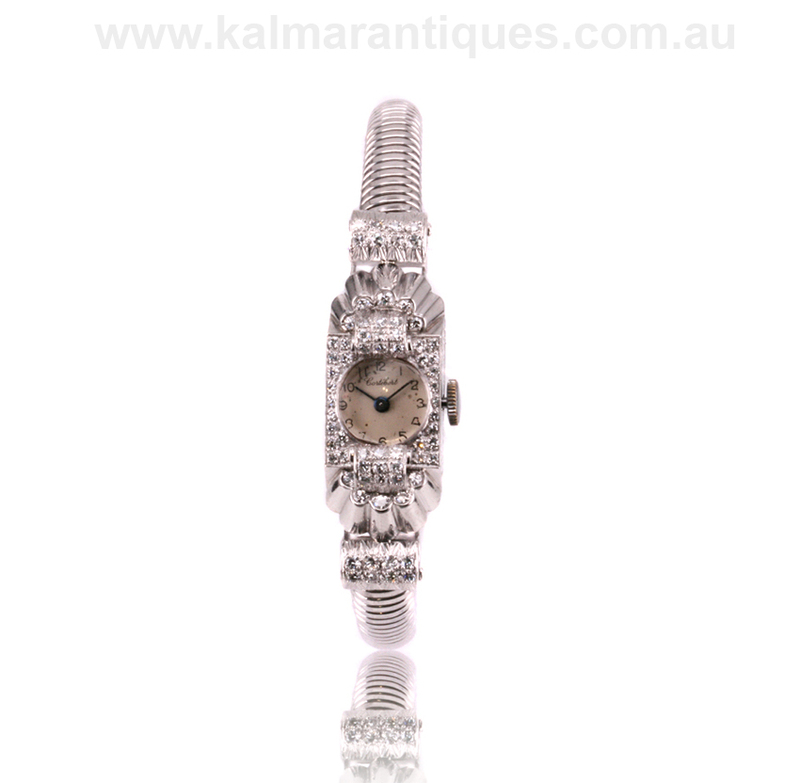 Product code: ES7936 Categories: Other Watches, Watches. 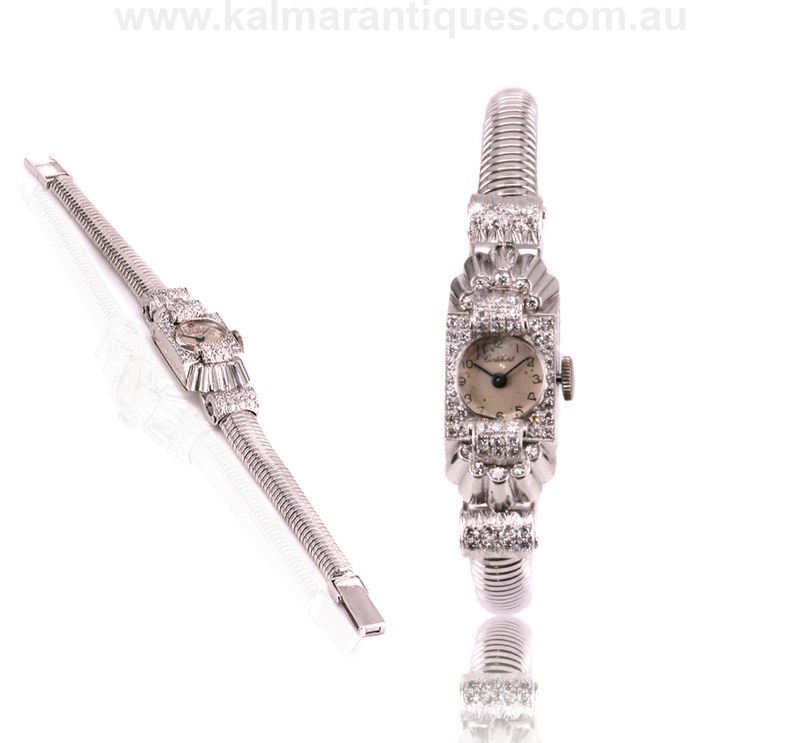 Here is a fabulous looking Retro era 18ct white gold diamond set watch from the 1950’s by Cortebert that is a piece of jewellery as much as a watch. The esteemed company Cortebert that made this watch was founded in 1790 and was so highly regarded, their movements were used by other watchmakers such as Rolex. This magnificent watch is set with seventy diamonds that totals 0.52 carats. However unlike many diamond watches today, they are not simply just set around the dial, rather they are so artistically designed and set into the watch in an incredible way that will have you admiring it every time that you look at your wrist to see the time. The way it incorporates a scroll design on the side is so beautiful to admire as is the elegant hand engraving on the sides. 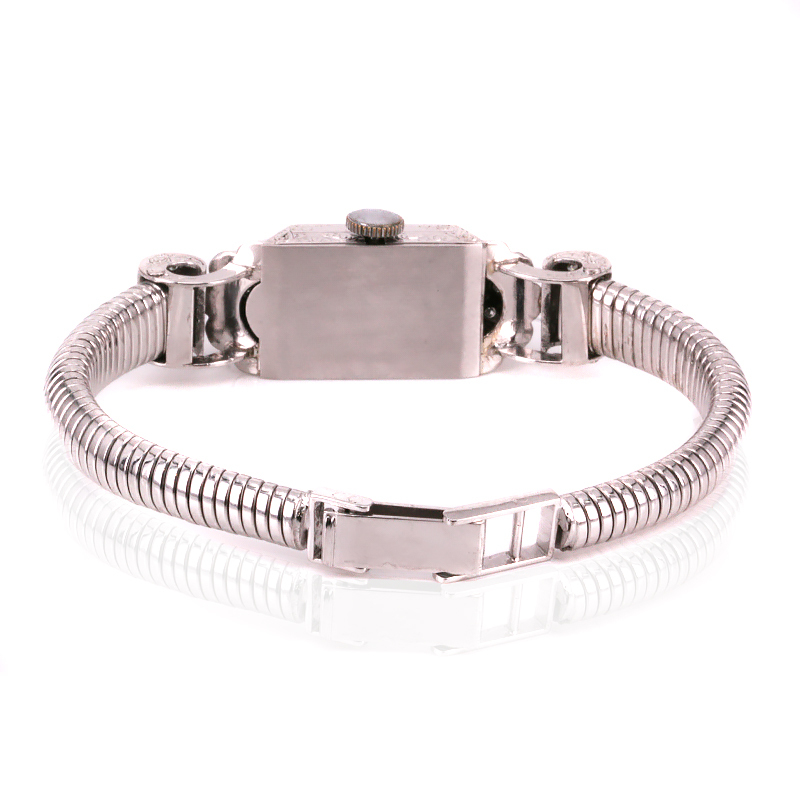 And then the bracelet is called a tubogas link, which is so incredibly tactile to feel and wraps around the wrist perfectly. Measuring a full 18cm in length, this watch looks and feels amazing on the wrist. Inside is the beautiful high grade 17 jewelled manual wind Cortebert movement that has just been recently serviced, runs beautifully and comes with our twelve month warranty. This is such a stunning example of a Retro watch that will always look incredible on the wrist and always be admired. Abraham-Louis Juillard founded Cortebert in Switzerland in 1790 and was named after the town in Switzerland, however his date is commonly used as the date that it was founded rather than the name which was not actually registered until 1855. From the 1920’s, Cortebert started supplying movements to other brands such as Rolex. They also made a high quality jump-hour movement that was later adopted by IWC. They continued up until the “Quartz Revolution” of the 1970’s.